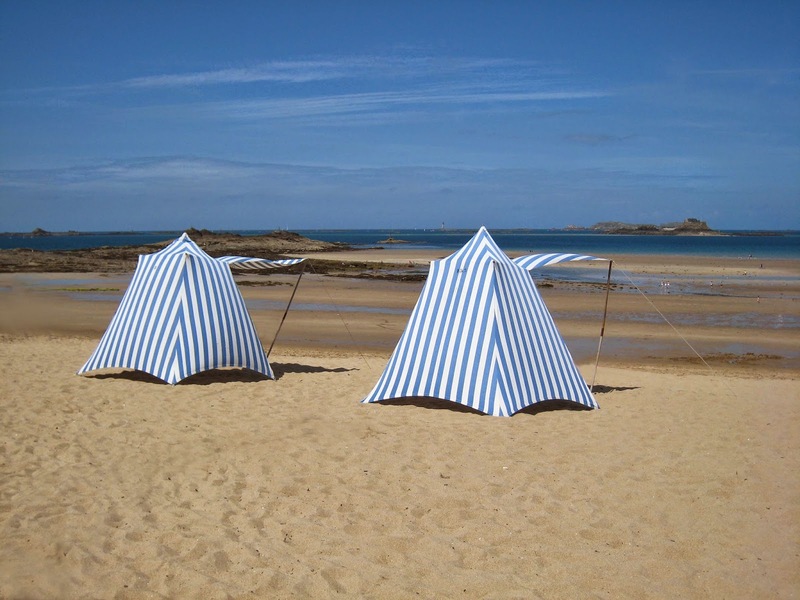 The little Breton town of Dinard, France, on the Emerald Coast of Bretagne looks like a picture postcard of an old-timey beach, with its blue striped tents. I feel like all you'd need to do is add bloomers to make the retro look complete. It's a magical place, and made even more so by this classic nautical motif called Breton stripes. They are lined up at the base of the grand hotels and along the main part of several of the town's most used beaches. There's great for shade and for a changing area, but you'll need to rent the use of one. Luckily, digital photos are free. Help me! I cannot stop taking pictures of them. Don't be fooled by the photos, though: The beaches and cabanes are not always so tranquil and serene. 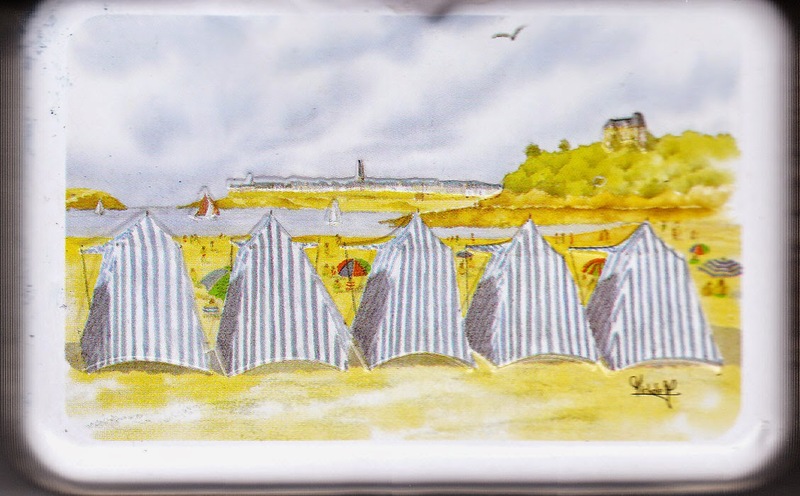 These cabanes are the hallmark of the Dinard beaches, so much so that a local Breton caramel tin -- among many other souvenirs -- has this on its cover. 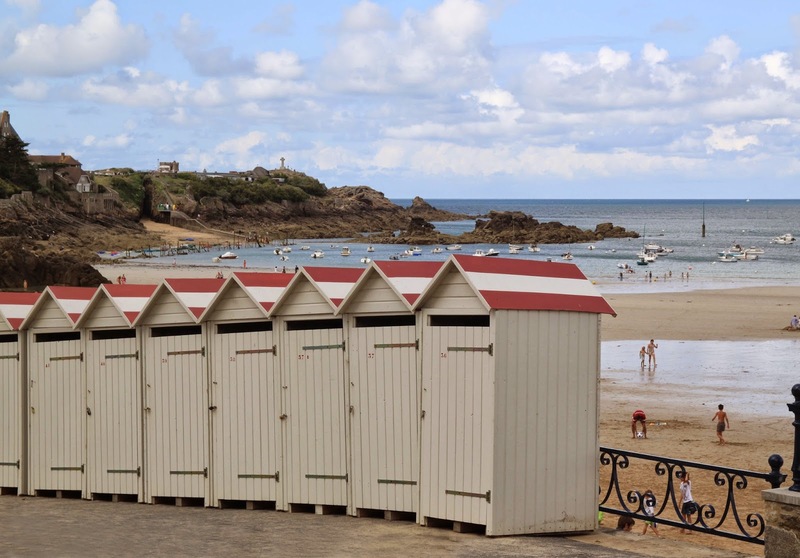 Other nearby town, such as Saint Lunaire, have their own cabanes, and their own look. Still stripey, still charming, still photogenic, despite the fact that I keep mistakenly calling the town Saint Nectaire, which is a not a Breton town at all but rather a stinky cheese from Auvergne. But is the Dinard look just such a French archetype you could die? Well that depends on your perspective. In fact, Dinard has been known as the British beach hangout since the early 1900s. Even today, it's commonly considered the most British of French beaches. It's not exactly a secret from Americans, either (ourselves included), so we hear English on the beach rather frequently. Here Pippa is in blue and white polka dots and checks. Sorry to burst her bubble, but it's like she's almost a Breton, but not quite. Also, some would argue the area's Frenchness -- and those people might most likely be the locals themselves. Bretagne has such a distinct regional pride that when talking about ethnic backgrounds in a classroom conversation, one of Pippa's friends once said that she was only half French...and the other half Breton. 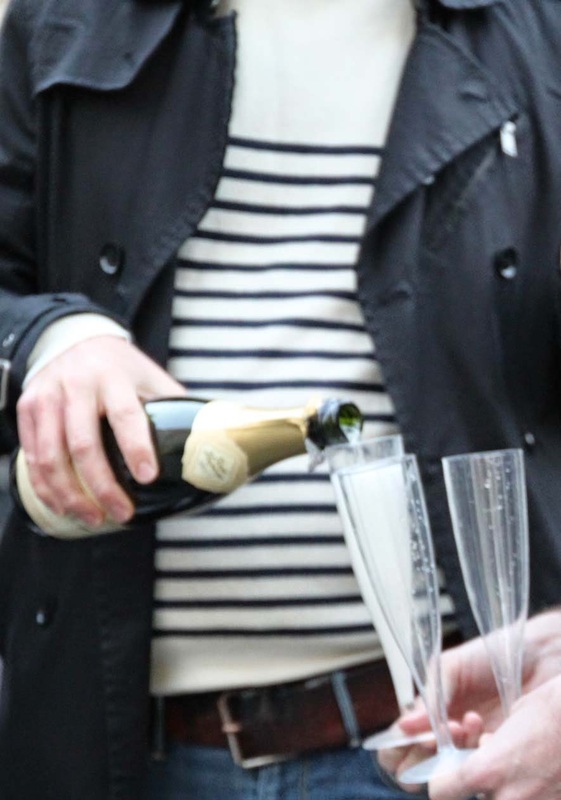 This blue-and-white striped look that we associate with France actually originated with the Breton sailors. 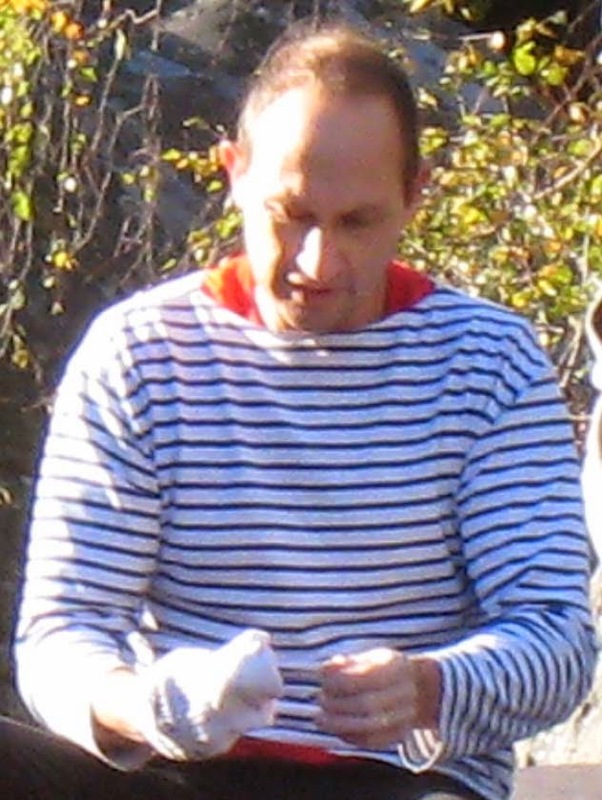 By now, you might just think of it as a French boat-neck striped shirt, and it's true that you will see this worn everywhere in the country, sometimes with a real self-awareness of its stereotypical "Frenchness". Other times, it just seems like it's the thing to wear. Here are four versions of it in one shot at a Parisian school field trip. None of these examples are actually taken in Bretagne, and most likely none of the people wearing them are Breton. 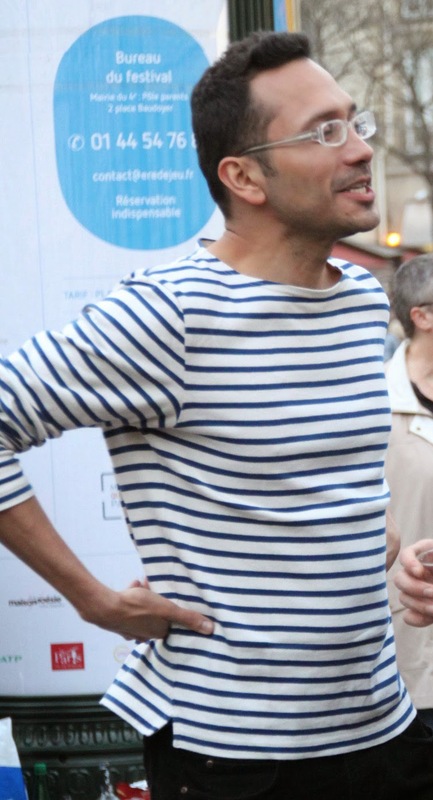 What you identify as a "French" shirt is really a Breton shirt. And it's a look that can be dated very precisely -- to March 27, 1858, when the French navy introduced this shirt as the uniform for its Breton sailors. The uniform shirt had 21 stripes on it, representing each of Napoleon's major victories. It's original name was a marinière (mariner), and it is still called that by people in the know. The shirt spread to local Breton workers and was gradually picked up around northern France as a work garment. It made the transition from pure utilitarian to fashion in 1917, when Coco Chanel used it as part of her nautical-inspired ready-to-wear collection. After that, it became common to see well-dressed women of the upper classes wearing these shirts with flared white pants at the ritzy beaches all around France, even the Mediterranean. And by the 1930s, men were wearing it also under dark blazers, often with a cravat. 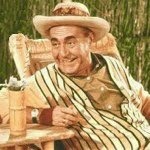 Am I the only person picturing Thurston Howell III on Gilligan's Island at this point? 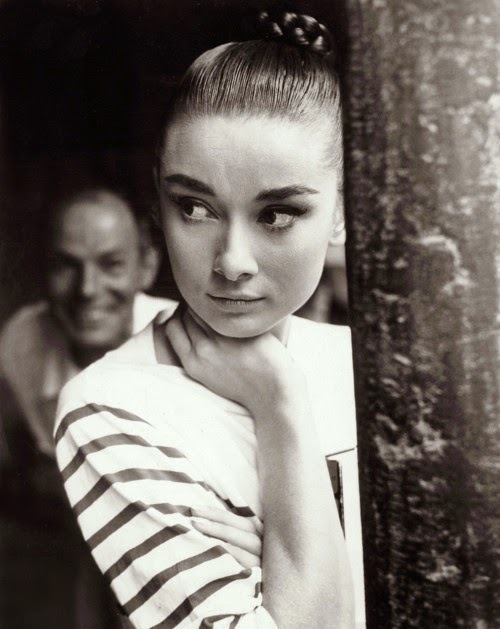 The look has been worn and popularized by no less than Marylin Monroe, Pablo Picasso, Brigitte Bardot, Andy Warhol, Jean-Paul Gaultier, Audrey Hepburn, and James Dean. Bleu d'Emeraude means "Blue of Emerald" and refers to the Cote d'Emeraude on which it is made, the Cote d'Emeraude being the Emerald Coast here in Bretagne, so-called because of the crystalline green-blue waters. Made with raw cow's milk and flavored with sel de guérande, west-coast France's elite salt, it comes from the Darley farmhouse that makes the ultra-strong Darley cheese whose smell an acquaintance once compared to the ears of her dog. It is then aged 4-6 weeks. Despite the fact that Bleu d'Emeraude comes from the same farm and is a blue cheese that, therefore, could theoretically blow you away with an almost chemical warfare smell, it is a rather mellow, delicious blue. Don't get me wrong: It still has a distinct blue tang. But the edges of both the aroma and taste are softened at the edges, not harsh or bitter. It's considered the little brother to the farmhouse's Bleu de Bellevue, but given its tall stature and exquisite taste, I'm not sure how much bigger big brother can be. But big brother is aged 8 weeks, and the farm describes the flavor of Bleu d'Emeraude as a little mellower and softer. It has a lovely creamy texture, and a saltier and less-sweet flavor than a Roquefort. It's delicious in every way and right up there among the best blue cheeses I've ever tasted. Not only is this a lovely blue cheese (blue like Breton stripes) it is also, very conveniently for my purposes, tall and tent-like with a distinctive vertical blue stripe right through my sample. And, it even comes from this coast -- the Emerald Coast -- making it a real, local cheese, and an obvious choice to pair with this story. Hey, you made PAW! Nice write-up. Congratulations.